It is one of the great mysteries of North American archaeology. 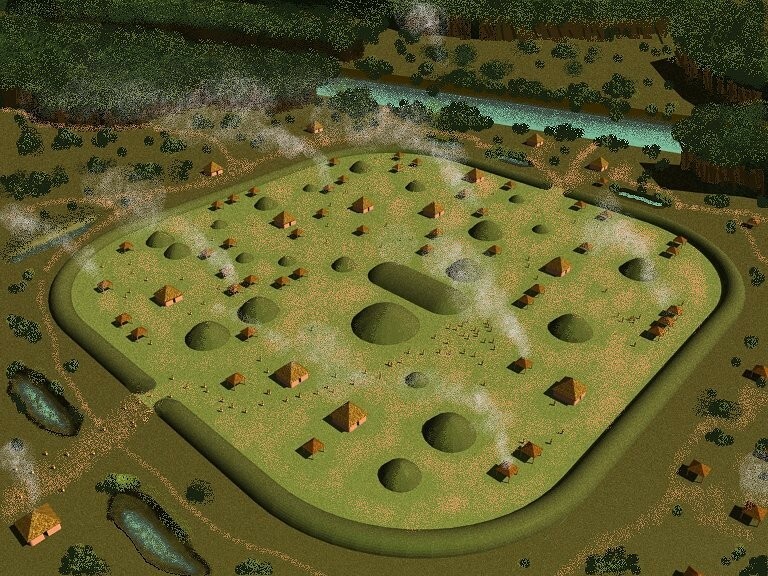 Between about 500 BC and the early 500s AD Native American societies in the Midwest and Upper Southeast built hundreds, perhaps thousands, of conical burial mounds, and in the later part of that era, dozens of spectacular geometric earthworks. Raw materials and finished artwork were traded across much of eastern North America. Around 500 AD, the construction and regional trading system ceased. What could have caused this sudden change? Visitors to the Hopewell Culture National Historical Park in Chillicothe are forever surprised by the scale of Native American earthworks along the Scioto River in eastern Ohio. The national park includes a cluster of ceremonial complexes that were constructed and occupied at differing time periods between 200 AD and early 500s AD This was the heartland of the Ohio Hopewell Culture, apparently the place where the Hopewell Tradition began, and the location of some of its most spectacular architectural creations. The Native American people, who built these mounds and ceremonial complexes, obviously did not call themselves “Hopewell’s.” That is a label coined by archaeologist Warren K. Moorehead in 1892, after he had excavated a group of mounds in Ross County, Ohio. The Hopewell family owned that land tract. Until recently, the builders of the mounds and ceremonial earthworks in the Midwest between 100 AD and early 500s AD were all labeled the Hopewell Culture. Archaeologists now believe that multiple ethnic groups, with shared cultural practices. participated in a “Hopewell Trade Network.” However, they can only speculate which Native American tribes are the descendants of the Hopewell Culture. Unlike the situations in the Southeastern and Southeastern United States, there are no clear cultural traits that link the past to the present. Most Hopewell ceremonial sites were capable of hosting thousands of visitors. The individual geometric earthworks usually covered many acres. Research by several scholars, such as Ohio anthropologist William A. Romain, have proven that these sites had multiple astronomical functions. However, it is still not understood why the Hopewell builders constructed precise geometric forms that were so large that they could only be observed in entirety from the sky above. The Ohio Hopewell People were preceded in the Upper Ohio Valley by the Adena People. The Adena received their name from an estate in central Ohio that contained a large, conical burial mound. They occupied the region from about 800 BC to 100 AD. Their mound building activities began around 500 BC. The early mounds were merely piles of detritus swept from village plazas, but toward the end of the culture developed into extremely large conical mounds surrounded by earthworks. The Adena and Hopewell Peoples shared the same territory for about three centuries. However, they were originally very different physiologically. The Adena were brachycephalic (broad-headed) and of medium stature like the peoples of the Southeast, who had been building mounds since around 3,500 BC. The Adena People had long heads and tall, gracile physiques. While the Adena mounds were usually major features of their villages, very few people lived permanently within or near Hopewell earthworks. In fact, only a handful of Hopewell villages have even been discovered in Ohio. Their villages were apparently non-permanent or seasonal settlements like those occupied in later centuries by the Native peoples of the Great Lakes region. In the early 500s construction stopped on all occupied Hopewell sites. Apparently, the population of the Ohio Valley region also dropped starkly. This speculation is more difficult to substantiate, since Hopewell villages were transient in nature. What archaeologists do know is that the ceremonial sites were abandoned for at least 300 years and very little construction or occupation ever occurred again. Tourist-oriented literature and the internet are awash with such statements as: The first mounds were built in the Ohio Valley. Ohio contains the oldest known geometric earthworks in the Americas. The first permanent villages were built in Ohio; or the first pottery in North America was made by the Adena’s. All of these statements are completely inaccurate. The oldest known ceremonial mounds in North America are at Watson Brake, LA in the northeastern corner of that state. The oldest known pottery in the Americas has been found along the Savannah River near Augusta, GA (c. 2,500 BC.) Pottery would not arrive in Ohio for another 1,700 years. The oldest known permanent villages in North America were found on Sapelo Island, GA. Such villages developed within or on large, circular shell mounds. These date from around 2,300 BC or earlier. Archaeologists have found evidence that there were originally hundreds of such villages along the South Atlantic Coast. The Adena tradition of building earthen rings around their mounds may have originated at these Southeastern shell rings. There is a superlative that the Ohio Hopewell sites justifiably deserve. They are the largest and most precise indigenous earthworks in North America. The only earthworks that approach them in scale or sophistication are at the Ortona archaeological site in southern Florida. While the Hopewell cultures were building massive earthworks, Native peoples in the Southeastern United States were mainly building permanent towns and villages that featured Mesoamerican-like pyramidal mounds, but some earthworks that resembled those of the Adena and Hopewell peoples. One of the last Hopewell sites, the Seip Complex in southeastern Ohio, contains a pyramidal mound that is very similar in shape to the largest mound at Kolomoki in Georgia. Between 200 AD and 1150 AD around Lake Okeechobee, FL, indigenous people built towns, interconnected by canals and raised roads that included large scale geometric and animal effigy earthworks, plus the Mesoamerican-like earthen pyramids. The Great Serpent Mound at Ortona, FL is about 300-500 years older than the Great Serpent Mound in Ohio. The Ohio Serpent Mound is now known to have not been built by the Hopewell's, but by a later culture around 1000 AD. During the past decade, archaeologists and architects have been shocked by the discovery of previously unknown South American civilizations in the eastern foothills of the Andes and western Amazon River Basin. The towns and villages of these cultures thrived from around 200 BC until the late 1500s AD. One of the architectural features of these communities that particularly intrigues researchers is that these earthworks are very similar, if not identical, to those of the Ohio Hopewell Culture. Many are also contemporary with the Hopewell sites. Denise Schaan, an anthropologist at the Federal University of Pará in Belém, Brazil, believes that the large town sites with geometric earthworks were first constructed in the Western Amazon Basin around 200 AD – the same time that the first large Hopewell complexes appeared. Unlike their counterparts in the Ohio Valley, the Amazonian earthworks had both ceremonial and practical functions. Houses and public buildings were constructed on top of most Amazonian earthworks. The Amazon peoples continued to develop such settlements for over 1,000 years after Hopewell sites were abandoned. The architectural and chronological similarity of Hopewell and Amazonian building traditions intrigues researchers, who think “out of the box.” What would cause two areas of the Western Hemisphere, so clearly separated by distance and climate, to build essentially the same structures at the same time? Why would they, along with a contemporary Natzca culture on the coast of Peru, be building massive designs on the ground that could only be appreciated from the sky? To date, researchers working in the Ohio Valley have not identified anything that would explain the abandonment of all the Hopewell sites. Varied interpretations consist of speculations about technological changes in the Native American culture of the Upper Ohio Valley. There is very little physical evidence to back up these hypotheses. Several indigenous towns in Georgia, Alabama and Florida were either abandoned or declined during the early 500s AD. However, villages and towns higher in elevation or farther from the ocean or Gulf of Mexico apparently fared better during this era. In the lower Southeast a temporary cultural decline was followed by continuous cultural advances that were directly ancestral to the contemporary Creek Indians. Midwestern anthropologists have not recognized any indigenous people, who are clearly descended from their mound builders. There is documented evidence to explain a sudden, but temporary decline in the Maya Civilization during the 500s AD. There were also multiple catastrophes in Europe during the 530s AD. A period when the climate was too cool for agriculture was followed by the Justinian Plague, which killed about half the population of Europe. The temporary climatic changes encouraged Germanic tribes to invade the British Isles, which were warmed by the Gulf Stream. Volcanoes in Mesoamerica seem to have caused a period of overcast weather in the Northern Hemisphere for several years or decades. Beginning around 490 AD there were a series of major volcanic eruptions in Mexico and Central America. These were climaxed by an eruption in present day El Salvador of unimaginable force by the Ilopango caldera (mega-volcano) in 535 AD. In 2010 American scientists, Robert Dull and John Southon, have found proof that this eruption desiccated a large area of Central America. They theorized that Ilopango could have produced enough volcanic dust to alter the North Hemisphere’s climate for several years. This temporary Ice Age would have been devastating to agricultural societies, particularly in northern latitudes. While volcanic winters would have obviously impacted agriculture in Central America, the Southeastern United States and Western Europe, the potential impact on the Hopewell villagers is less understood. By 500 AD the Hopewell cultures were cultivating gardens, but they remained dependent on hunting, fishing and gathering of wild foods for much of their diet. Did the climatic change affect the production of nuts and fruits by wild vegetation? Did game animals produce fewer offspring? Were there several years when droughts or severe freezes occurred in the summer? The answers to these questions are not known at this time. The potential for a temporary climate change alone to destroy the long established Hopewell cultural tradition has not been proven. Another possible culprit for its disappearance could have been a plague. The devastating plague that killed half of Europe in the 540s AD, may have began elsewhere and then spread around the world. An indigenous pathogen may have become endemic in the Americas because of overcast, cool, damp conditions. Evidence of extensive Hopewell trade contacts have been found on the Mississippi River as far south as Marksville, LA. Perhaps a plague entered the Mississippi and was carried upstream by traders. Like many other mysteries about the Western Hemisphere’s past, the disappearance of Hopewell cultural traditions remains an enigma that will be answered by some future researcher. At present no anthropologist can say with certainty, who the Hopewell People were or where they went.